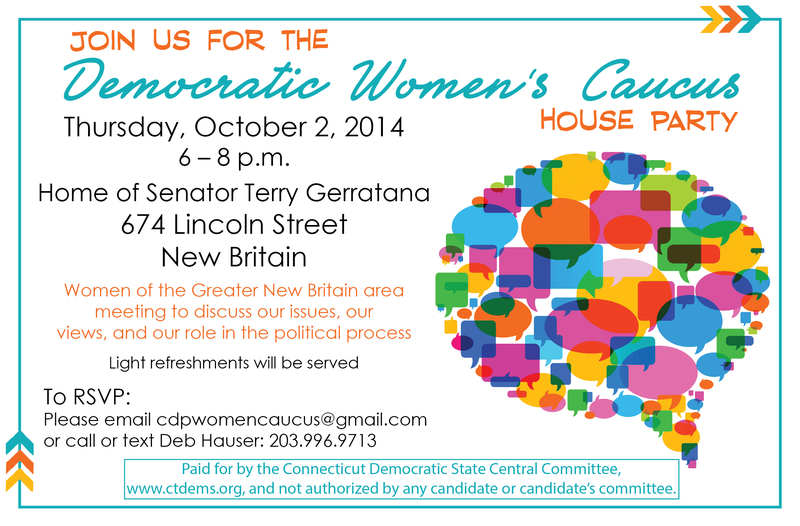 LWV Potluck & Pols…..Dem Women’s Caucus….Gaffney Voters Sent To DiLoreto….Zherka and The 2013 Campaign…. The New Britain Area League of Women Voters (LWV) will get political (in a non-partisan way) when it hosts a “Pasta, Pot Luck & Politicians” dinner and discussion on Monday September 29th. Invited guests include the Mayor, Common Council and Board of Education. The dinner and dialogue will be held at Trinity On Main Rotunda, 69 Main Street. Dinner begins at 6:30 and the discussion will start at 7:15. Attendees are asked to bring a salad or dessert or pay $5. The LWV will provide the pasta and sauce. Participants will share their views on current issues and discuss ways to expand the participation of women in the political process. Senator Gerratana, representing Berlin, New Britain and a portion of Farmington, is seeking a new term in the State Senate. She is Senate Chair of the Public Health Committee. The Registrars of Voters sent notification Thursday to voters in Voting District 4 that their polling place will be at DiLoreto School this year because of construction at Gaffney Elementary School. DiLoreto School lies in the 22nd Assembly District represented by State Rep. Betty Boukus of Plainville. Gaffney School voters are represented by State Rep. Rick Lopes of the 24th Assembly District. Registrars reportedly plan to have “two separate check in lines” at DiLoreto to direct voters from two different state representative districts at DiLoreto. The Democratic Town Committee has requested a meeting with the Registrar to review the notification process and the Election Day plan to handle voters from two different legislative districts at the same polling place. Zherka Arrest A Fresh Reminder Of Who Was Behind City Journal’s Yellow Journalism, Unreported 6-Figure Campaign Money In 2013 Municipal Election. The arrest and jailing of former Farmington Hills Apartment Complex owner Sam Zherka earlier this month was a fresh reminder of the collusion between and among New Britain Republicans, the New Britain City Journal and a small group of out-of-town landlords throughout 2013. Zherka faces a long indictment for alleged bank loan fraud, income tax fraud and witness tampering . Two of the bank fraud charges relate to his ownership of Farmington Hills complex in the Ledgecrest Avenue area. In New Britain, Zherka was a ring leader for out-of-town landlords who, in Zherka’s own words, put together $100,000 last year to “wipe out” Mayor O’Brien and Democrats on the Common Council. The political spending began at a raucous November 2012 City Hall hearing on proposed fees for absentee landlords to pay for housing and code enforcement. Zherka admitted to transporting tenants and paying them to go to City Hall to oppose the policy. Thereafter the assault on the truth in the pages of the City Journal began. At a CT Property Owners Association meeting at Stanley Golf Course at the height of the 2013 municipal campaign former Mayor Tim Stewart gave a glowing introduction to Zherka who then announced the raising of $100,000 to “wipe out” elected officials in New Britain. At the same meeting, current Corporation Counsel Gennaro Bizzarro ( this year’s 24th District Republican for state representative), addressed the CTPOA group. Bizzarro, in addition to his City Hall duties, has represented the CTPOA through his law practice. Mayor Stewart and other members of the Republican slate addressed CTPOA meetings pledging to repeal absentee landlord fees. Following Zherka’s arrest this month, the New Britain Republican Town Committee blocked the video of Stewart, Zherka and Bizzarro speaking together; covering up the off the books financial help and gutter political action carried out by Zherka on their behalf last year. Last year’s cash cow and friendly political provocateur is this year’s liability. The Waterbury-based Connecticut Property Owners Association (CTPOA), led by Bob DeCosmo , later established a political action committee to finance a campaign against Democrats. But the CTPOA PAC was merely a front group. Very little campaign money was raised in legitimate and legal ways by the out-of-town landlord PAC for Stewart or any other candidates. Scurrilous is too kind a word to describe the numerous editions of the City Journal throughout 2013 and into 2014 which contained misrepresentations and inflammatory language against O’Brien and members of the Common Council. Zherka and the CTPOA also created a now defunct website, http://www.savenewbritain.com, that spread the City Journal’s false and inflammatory information on the city administration and council Democrats last year. Don’t count on Sam Zherka’s name appearing in the pages of the City Journal nor at the GOP town committee site anymore. It’s an open question, however, whether Zherka’s ill-gotten money and publishing resources may still be underwriting the City Journal that has morphed into a newsletter for Mayor Erin Stewart in the first year of her administration. Residents of all political stripes committed to the rule of law and civility in local politics can only hope that dark campaign money, voter intimidation and yellow journalism masquerading as community journalism will not be repeated in our city. What occurred during the 2013 municipal election was an assault on democracy for which many questions remain to be answered. This entry was posted in City Hall, Gerratana, Hard Hittin' New Britain, Housing, Meeting/Event, Weekend Update, Women's Issues. Bookmark the permalink.